The author thanks Eleanor Davey, Olga Gnydiuk, Cédric Cotter, Eline van Ommen, Nicola Owtram, Raluca Grosescu, Ned Richardson-Little, Lily Chang, Franziska Exeler, Milinda Banerjee, Thomas Clausen, Rohit De, and the four anonymous reviewers from Law and History Review for their insightful and useful feedback. This article was first presented at the conference “State Socialism, Legal Experts, and the Genesis of International Criminal and Humanitarian Law after 1945,” at the Humboldt University of Berlin; and the workshop “War, Law and Crime: Legal Histories of the Second World War and its Aftermath,” at Magdalene College, University of Cambridge. 1. For examples of this dominant trend in the historiography, see Crowe, David M., War Crimes, Genocide, and Justice (New York: Palgrave Macmillan, 2014); Ann-Rieffer-Flanagan, Barbara, “Is Neutral Humanitarianism Dead? Red Cross Neutrality: Walking the Tightrope of Neutral Humanitarianism,” Human Rights Quarterly 31 (2009): 888–915, at 896; Meron, Theodor, “The Humanization of Humanitarian Law,” The American Journal of International Law 94 (2000): 239–78; and Rey-Schyrr, Catherine, De Yalta à Dien Bien Phu. Histoire du Comité international de la Croix-Rouge 1945–1955 (Geneva: Georg–CICR, 2007). 2. Borgwardt, Elizabeth, A New Deal for the World: America's Vision for Human Rights (Cambridge, MA: Harvard University Press, 2005). 3. Hirsch, Francine, “The Soviets at Nuremberg: International Law, Propaganda, and the Making of the Postwar Order,” The American Historical Review 113 (2008): 701–30, at 701. On how United States' officials conceived of the Geneva Conventions: Barsalou, Olivier, “Preparing for War: The USA and the Making of the 1949 Geneva Conventions on the Laws of War,” Journal of Conflict & Security Law 23 (2017): 1–25. 4. One example is William Hitchcock's crucial account of the making of the Geneva Conventions. He similarly credits the ICRC and Western European “humanitarian states in the 1949 negotiations—France, Norway, Sweden, Denmark” for their ambitious scope. Hitchcock, William, “Human Rights and the Laws of War: The Geneva Conventions of 1949,” in The Human Rights Revolution. An International History, ed. Iriye, Akira, Goedde, Petra, and Hitchcock, William (New York: Oxford University Press, 2012), 93–112, at 101. 5. 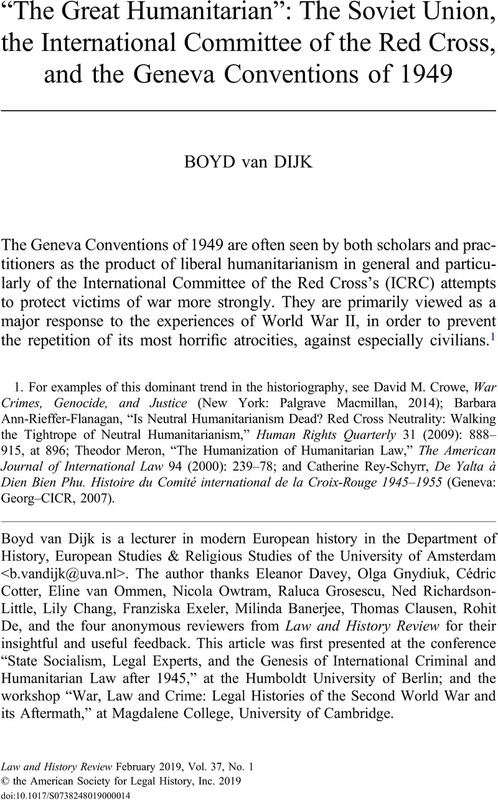 For an overview of the ICRC's history, see Bugnion, François, Le Comité international de la Croix-Rouge et la protection des victimes de la guerre (Geneva: CICR, 2000); and Rey-Schyrr, De Yalta à Dien Bien Phu. 6. He gave two exceptions to this rule: the 1956 Hungarian crisis and the 1962 Cuban missile crisis. Forsythe, David P., The Humanitarians: The International Committee of the Red Cross (Cambridge: Cambridge University Press, 2005), 53. 7. Most scholars in the field of Soviet legal history tend to focus on fields of international law other than humanitarian law. One example is: Weiss-Wendt, Anton, The Soviet Union and the Gutting of the UN Genocide Convention (Madison: University of Wisconsin Press, 2017). The legal scholar Lauri Mälksoo has focused mostly on the Tsarist contributions to the Hague Conventions. Mälksoo, Lauri, Russian Approaches to International Law (Oxford: Oxford University Press, 2015), 70–71. 8. Hirsch, “The Soviets at Nuremberg,” 726. 9. Ginsburgs, George, “Laws of War and War Crimes on the Russian Front during World War II: The Soviet View,” Soviet Studies 11 (1960): 253–85, at 280. 10. See Betts, Paul, “Universalism and its Discontents: Humanity as a Twentieth-Century Concept,” in Humanity: A History of European Concepts in Practice from the Sixteenth Century to the Present, ed. Klose, Fabian and Thulin, Mirjam (Göttingen: Vandenhoeck & Ruprecht, 2016), 51–70, at 65; Mantilla, Giovanni, “Forum Isolation: Social Opprobrium and the Origins of the International Law of Internal Conflict,” International Organization 72 (2018): 317–49; and Kinsella, Helen, The Image Before the Weapon: A Critical History of the Distinction Between Combatant and Civilian (Ithaca, NY: Cornell University Press, 2011), 118–19. 11. Report Soviet–Ukrainian Delegation, no. F. 2, Op. 12cc, Spr. 969, Ark. 60–76, Tsentral′nyi derzhavnyi arhiv vyschykh organiv vlady ta upravlinnia Ukrainy, Kiev, Ukraine (hereafter TSDAVO). 12. The only reference to this episode I found is a tiny section in Best's pioneering account. Using mainly Anglophone sources and taking a partisan position in favor of the ICRC, he briefly describes how the French had tried to “sell the ICRC down the river…to lure the USSR to the conference table.” “Fortunately,” he adds, this plan failed. Geoffrey Best, War and Law since 1945 (Oxford: Clarendon Press, 1994), 89. 13. The role of other socialist states such as Yugoslavia lies beyond the scope of this article. 14. Telegram French Embassy Madrid, August 19, 1948, no. 159 – TER, Unions Internationales, 1944–1960 (Unions), Les Archives Diplomatiques, Paris, France (hereafter LAD). 15. Report of U.S. Delegation to the Stockholm Red Cross Conference, 1948, Provost Marshal General, no. 672, National Archives and Records Administration, College Park, MD, United States (hereafter NARA). 16. One reason for this early ICRC–Soviet partnership in the early 1920s was the increasingly competitive humanitarian environment emerging at the end of the “Greater War.” Near this period, the ICRC witnessed the rise of several humanitarian competitors, from the League of Red Cross Societies to Herbert Hoover's American Relief Administration (ARA). Feeling pressured by this humanitarian arms race and considering the institutional benefits of intervening further internationally, the ICRC decided to become involved in Tsarist Russia. Jean-François Fayet, “Le CICR et la Russie: un peu plus que de l'humanitaire,” 63–64. https://serval.unil.ch/resource/serval:BIB_42208FB6267C.P001/REF (accessed February 27, 2017); and Fayet, Jean-François and Huber, Peter, “La mission Wehrlin du CICR en Union Soviétique (1920–1938),” Revue Internationale de la Croix-Rouge et Bulletin international des Sociétés de la Croix-Rouge 85 (2003): 95–117, at 100. 17. Fayet and Huber, “La mission Wehrlin,” 96. 18. Lowe, Kimberly A., “Humanitarianism and National Sovereignty: Red Cross Intervention on behalf of Political Prisoners in Soviet Russia, 1921–3,” Journal of Contemporary History 49 (2014): 652–74, at 663–66. 19. Fayet, “Le CICR et la Russie,” 57, 60–61; Bugnion, Le Comité international de la Croix-Rouge, 118–121; and Fayet and Huber, “La mission Wehrlin,” 110–11. 20. Sasson, Tehila, “From Empire to Humanity: The Russian Famine and the Imperial Origins of International Humanitarianism,” Journal of British Studies 55 (2016): 519–37; and Cabanes, Brunco, The Great War and the Origins of Humanitarianism, 1918–1924 (New York: Cambridge University Press, 2014). 21. Fayet, “Le CICR et la Russie,” 62; and Lowe, “Humanitarianism and National Sovereignty,” 669–70. 22. Fayet, “Le CICR et la Russie,” 65, 114. 24. Debons, Delphine, Fleury, Antoine, and Pitteloud, Jean-François, Katyn et la Suisse: Experts et expertises médicales dans les crises humanitaires 1920–2007 – Katyn and Switzerland: Forensic Investigators and Investigations in Humanitarian Crises 1920–2007 (Geneva: Georg, 2009). 25. See Ginsburgs, George, Moscow's Road to Nuremberg: The Soviet Background to the Trial (The Hague: Kluwer Law International, 1996), 27; and Bugnion, Le Comité international de la Croix-Rouge, 213–17. 26. Favez, Jean-Claude, Une mission impossible? Le CICR, les déportations et les camps de concentration nazis (Lausanne: Éditions Payot, 1988). 27. Fayet, “Le CICR et la Russie,” 67–68. 29. Steinacher, Gerald, Humanitarians at War. The Red Cross in the Shadow of the Holocaust (Oxford: Oxford University Press, 2017), 98–99. 30. Although the history of ICRC–Yugoslav relations lies beyond the scope of this article, it is important to note three important details regarding this matter. During the early drafting stages, Yugoslavia was one of the most aggressive of the socialist states in criticizing the ICRC's wartime record. In 1949, after the Tito–Stalin split, the Yugoslavs sent only two observers to the diplomatic conference in Geneva. After the diplomatic conference's closure, Belgrade signed the four Geneva Conventions with reservations on points related to, among other things, the role of humanitarian organizations such as the ICRC. 31. See Junod, Dominique-Debora, The Imperiled Red Cross and the Palestine-Eretz-Yisrael Conflict 1945–1952. The Influence of Institutional Concerns on a Humanitarian Operation (New York: Kegan Paul International, 1996), 24; and Crossland, James, Britain and the International Committee of the Red Cross, 1939–1945 (New York: Palgrave Macmillan, 2014), 194–95. 32. While basing their views mostly on Swiss sources, Swiss historians have often tended to blame the boycott of the ICRC on “Soviet ignorance of the Red Cross world and the humanitarian conventions.” Junod, The Imperiled Red Cross, 248. 33. Report Soviet-Ukrainian Delegation, no. F. 2, Op. 12cc, Spr. 969, Ark. 60–76, TSDAVO. 34. Junod, The Imperiled Red Cross, 243–44; and Procès-Verbaux Séance Plénière du CICR, December 6, 1946, no. A - PV - A - PL - 18, Archives of the International Commission of the Red Cross, Geneva, Switzerland (hereafter AICRC). 35. See Procès-Verbaux Séance Plénière du CICR, June 20, 1946, no. A PV A PL.18, AICRC; Procès-Verbaux Commission Juridique, May 29, 1946, no. A PV JUR.1, AICRC; Letter Soviet Ambassador in France, May 13, 1946, no. CR - 240 - 7, AICRC; and Report Conference Préliminaire en vue de la révision et de l'extension des Conventions de Genève, April 30, 1947, no. 160, Unions Internationales, LAD. 36. See Report Conference Préliminaire en vue de la révision et de l'extension des Conventions de Genève, April 30, 1947, no. 160, Unions, LAD; Cable Lamarle on Soviet absence II, April 23, 1947, no. 160, Unions, LAD; and Cable Lamarle on Soviet absence I, April 21, 1947, no. 160, Unions, LAD. 37. Cable Lamarle on Future Program, April 26, 1947, no. 160 - BIS, Unions, LAD; and Report Direction des Unions Internationales Prochaines Conférences en vue de la révision des CDG, 24 May 1947, no. 159, Unions, LAD. 38. The Standing Commission was a cooperation between the ICRC and the League of Red Cross Societies. Its main task was to take care of any differences between them and of the agenda for the next Red Cross Conference. Folke Bernadotte was chosen as its president. Junod, The Imperiled Red Cross, 26–27. 39. Minutes Meeting between Lamarle and M.W. Michel of the ICRC in France, March 20, 1948, no. CR - 238 – 4, AICRC. 40. Procès-Verbaux Séance Plénière du CICR, June 20, 1946, no. A PV A PL.18, AICRC. 41. See Minutes Prisoners of War Committee, July 9, 1947, no. 672, Provost Marshal General, NARA; Cable Lamarle on Soviet absence II, April 23, 1947, no. 160, Unions, LAD; Cable Lamarle on Soviet absence I, April 21, 1947, no. 160, Unions, LAD; and Report Direction des Unions Internationales Prochaines Conférences en vue de la révision des CDG, May 24, 1947, no. 159, Unions, LAD. 42. Note Edouard de Haller or Max Petitpierre on plan for government experts conference, August 6, 1947, no. E2001E#1967/113#16029, Swiss Federal Archives, Bern, Switzerland (hereafter SFA). 43. On the Swedish–ICRC rivalry: Steinacher, Humanitarians at War. 44. See Letter Direction des Unions Internationales to Cahen-Salvador, July 16, 1947, no. 159, Unions, LAD; Report Direction des Unions Internationales Prochaines Conférences en vue de la révision des CDG, May 24, 1947, no. 159, Unions, LAD; and Letter French Embassy in Washington, July 2, 1947, no. 674, Provost Marshal General, NARA. 45. Note Haller for Petitpierre on plan for government experts conference, August 6, 1947, no. E2001E#1967/113#16029, SFA; Letter French Ambassador in Belgium, November 6, 1947, no. 159, Unions, LAD; and Note Direction des Unions Internationales on Soviet participation, November 12, 1947, no. 159, Unions, LAD. 46. Junod, The Imperiled Red Cross, 29–30. 47. Letter French Embassy in Washington, July 2, 1947, no. 674, Provost Marshal General, NARA. 48. Note Haller on Meeting with Pilloud, August 5, 1947, no. E2001E#1000/1571#3310/BD258, SFA. 49. Telegram Direction des Unions Internationales, December 20, 1947, no. 159, Unions, LAD. 50. Letter Haller for Carl Jacob Burckhardt, December 30, 1947, no. E2001E#1000/1571#3310/BD258, SFA. 51. See Telegram Direction des Unions Internationales to Embassy in Washington, January 21, 1948, no. 159, Unions, LAD; and Telegram Embassy Washington, February 11, 1948, no. 159, Unions, LAD. 52. Letter Haller for Burckhardt, December 30, 1947, no. E2001E#1000/1571#3310/BD258, SFA. 53. Letter Haller on Government Expert Conference, January 23, 1948, no. E2001E#1000/1571#3310/BD258, SFA. 54. See Minutes of Meeting Haller and Zehnder, December 23, 1947, no. E2001E#1000/1571#3310/BD258, SFA; and Procès-Verbaux Séance Plénière du CICR, January 15, 1948, no. A PV A PL.19, AICRC. 55. Swiss attempts to persuade the Czech Foreign Minister Jan Masaryk to personally intervene led to nothing. Letter Swiss Legation on Czech response, January 5, 1948, no. E2001E#1000/1571#3310/BD258, SFA. 56. Junod, The Imperiled Red Cross, 236. 57. Letter Dutch Embassy in Madrid, June 21, 1948, no. 3049, Code-Archief Ministerie van Buitenlandse Zaken, National Archives of the Netherlands, The Hague, the Netherlands (hereafter NA). 58. See Letter Dutch Legation in Madrid, June 21, 1948, no. 3049, Code-Archief Ministerie van Buitenlandse Zaken, NA; Letter Dutch Legation in Madrid, August 3, 1948, no. 3049, Code-Archief Ministerie van Buitenlandse Zaken, NA. ; and Minutes Meeting ICRC Delegation Stockholm Conference, August 3, 1948, no. CRI – 25 VIII – Dossier 8 Stockholm 1948, AICRC. 59. See Telegram French Delegation Stockholm, August 10, 1948, no. 159 – TER, Unions, LAD; and Telegram Hardion, August 21, 1948, no. 159 – TER, Unions, LAD. 60. The Board of Governors of the League of Red Cross Societies held a simultaneous meeting. 61. Telegram French Delegation on Soviet absence, August 30, 1948, no. 159, Unions, LAD. 62. See Letter Petitpierre to Swiss Legation in Egypt, September 20, 1948, no. E2200.39–03#1971/34#818, SFA; and Junod, The Imperiled Red Cross, 253. 63. See Telegram Lamarle on Soviet absence, August 26 1948, no. 159 – TER, Unions, LAD; and Note on Stockholm Conference, September 3, 1948, no. 159 – TER, Unions, LAD. 64. Cable Washington on French initiative, January 28, 1949, no. 161, Unions, LAD. 65. Memo Clattenburg on Recommendations, September 15, 1948, no. 22, RG 43, 5536, NARA. 66. Correspondence Kemball on Civil War Provision, May 10, 1949, no. 4149, FO369 (Foreign Office), The National Archives, Kew, the United Kingdom (hereafter TNA). 67. Junod, The Imperiled Red Cross, 253. 68. Note Petitpierre on Diplomatic Conference, February 3, 1949, E2001E#1967/113#16123/BD874, SFA. 69. See Telegram Swiss delegation Moscow on Soviet participation, April 15, 1949, E2001E#1967/113#16123/BD874, SFA. On April 15, 1949, at night, the Soviet Vice Minister of Foreign Affairs Valerian Zorin announced that the Central Committee of the Communist Party had decided that the Soviets, including the Ukrainian and Belorussian Soviet Republics, would participate. Accompanying Letter Report Soviet–Ukrainian Delegation, no. F. 2, Op. 12cc, Spr. 968, Ark. 76, 77, TSDAVO. 70. Letter ICRC Delegate in Czechoslovakia, April 25, 1949, no. CR – 221 – 4, AICRC. 71. Yearbook of the International Law Commission 1949. Summary Records and Documents of the First Sessions Including the Report of the Commission to the General Assembly (New York: United Nations, 1956), 51–52. 73. Memo High Commissioner to Secretary of State for External Affairs, May 23, 1949, no. 619–B-40-PART 5, RG-25-Vol. 3398, Library and Archives Canada, Ottawa, Canada (hereafter LAC). 74. Conference Diplomatique. Rapport Spécial Etabli par Pilloud, September 16, 1949, no. CR-254-1, AICRC. For the Soviet suspicions, see Report Soviet–Ukrainian Delegation, no. F. 2, Op. 12cc, Spr. 969, Ark. 60–76, TSDAVO. 75. Morozov had also acted as Soviet representative during the negotiations on the Genocide Convention. See Weiss-Wendt, The Soviet Union and the Gutting of the UN Genocide Convention. 76. See UK Report on Meetings with Slavin and Morozov, May 13, 1949, no. 4150, FO369, TNA. 77. See Final Record of the Diplomatic Conference of Geneva of 1949, 326, Vol. II, Sections A and B, Library of Congress, Washington, DC, United States (hereafter LOC). 78. Lagrou, Pieter, “1945–1955: The Age of Total War,” in Histories of the Aftermath: The Legacies of the Second World War in Europe, ed. Biess, Frank and Moeller, Robert (New York: Berghahn Books, 2010), 287–96, at 290. 79. Report Soviet–Ukrainian Delegation, no. F. 2, Op. 12cc, Spr. 969, Ark. 60–76, TSDAVO. 80. Report of New Zealand Delegation to Diplomatic Conference of Geneva 1949, AAYS 8638 W2054 ADW2054/1220/3/3 (R18524114), Archives New Zealand, Wellington, New Zealand (hereafter ANZ). 81. Ginsburgs, “Laws of War and War Crime,” 278. 82. Socher, Johannes, “Lenin, (Just) Wars of National Liberation, and the Soviet Doctrine on the Use of Force,” Journal of the History of International Law 19 (2017): 219–45. 83. Ginsburgs, Moscow's Road to Nuremberg, 60–63. 84. Final Record of the Diplomatic Conference of Geneva of 1949, 426, Vol. IIA, LOC. 85. Revised and New Draft Convention for the Protection of War Victims, 1948, LOC. 86. Report Soviet–Ukrainian Delegation, no. F. 2, Op. 12cc, Spr. 969, Ark. 60–76, TSDAVO. 87. This point was first made brilliantly by Jessica Whyte. See Jessica Whyte, “Human Rights after October,” Overland 228 (2017). 88. Cable US Delegation on Diplomatic Conference, May 2, 1949, no. 5, RG 43 – Entry 40, NARA. 89. Report Soviet–Ukrainian Delegation, no. F. 2, Op. 12cc, Spr. 969, Ark. 60–76, TSDAVO. 90. For examples of this type of framing, see Pravda, May 13, 1949, July 22, 1949, July 24, 1949, and August 1, 1949. 91. Report of New Zealand Delegation to Diplomatic Conference of Geneva 1949, AAYS 8638 W2054 ADW2054/1220/3/3 (R18524114), ANZ. 92. It is striking how the Soviets tried to overcome (or rather gloss over) the conceptual tension between the idea of promoting the rules for warfare and that of advocating a “struggle for peace.” Johnston, Timothy, “Peace or Pacifism? The Soviet ‘Struggle for Peace in All the World,’ 1948–54,” The Slavonic and East European Review 86 (2008): 259–82, at 259. 93. See Minutes Meeting at State Department, July 7, 1949, no. 669, Provost Marshal General, NARA. 94. See Correspondence Foreign Office on Questions Emrys Hughes, July 6, 1949, no. 4156, FO369, TNA. 95. Report Wershof on Civilian Convention, no. 619-B-40-File Pocket, RG 25 – Vol. 5020, LAC. 96. Final Record of the Diplomatic Conference of Geneva of 1949, 326, Vol. II, Section B, LOC. 97. Report Soviet–Ukrainian Delegation, no. F. 2, Op. 12cc, Spr. 969, Ark. 60–76, TSDAVO. 98. Most parts of the literature regarding the history of Common Article 3 have devoted little attention to the brutal Soviet counterinsurgency campaigns from after 1944, and their possible impact on the article's making. For an example of this trend describing the Soviet Union “as a stable autocracy keeping socialist societies under the tight Stalinist grip,” see Mantilla, “Forum Isolation: Social Opprobrium and the Origins of the International Law of Internal Conflict,” 340. 99. For a similar argument regarding the Soviet attitude toward the making of the Genocide Convention, see Weiss-Wendt, The Soviet Union and the Gutting of the UN Genocide Convention. For a well-researched history of Soviet counterinsurgency efforts against nationalist insurgencies in the Baltic states and Western Ukraine, see Statiev, Alexander, The Soviet Counterinsurgency in the Western Borderlands (Cambridge: Cambridge University Press, 2010). 100. Record of Meeting with Attorney-General, May 16, 1949, no. 4150, FO360, TNA. 101. The most far-reaching proposal to apply the Geneva Conventions even to so-called “emergencies” and small-scale internal wars came from the World Jewish Congress (WJC). See Memorandum of the WJC on the Draft Convention for the Protection of Civilian Persons in Time of War submitted to the XVIIth International Red Cross Conference, 4–5, Series B69, no. 17, American Jewish Archives, Cincinnati, Ohio. 102. For the details of those Soviet proposals, see Final Record of the Diplomatic Conference of Geneva of 1949, Vol. III, LOC. 103. This principle signified a symbolic break with the legalizing of racial segregation under the 1929 Convention Relative to the Treatment of Prisoners of War. See Schroer, Timothy L., “The Emergence and Early Demise of Codified Racial Segregation of Prisoners of War under the Geneva Conventions of 1929 and 1949,” Journal of the History of International Law 15 (2013): 53–76. 104. The exact voting record of the tumultuous final stages of the drafting of Common Article 3 is not clear, as a result of a secret ballot (a Burmese plan criticized by Soviet delegates but supported by their powerful United States and United Kingdom adversaries). It is likely that the Dutch (confirmed), Canadians (confirmed), New Zealanders, Australians, Spanish, Belgians, Portugese (who initially made a reservation for Common Article 3), one or several Asian delegations, and a few others voted in favor of the alternative Burmese motion to delete Common Article 3. The final voting record of the British, French, Soviet, and United States delegations is not obvious either. It is not unlikely that some of them voted secretly in favor of the Burmese motion, in light of (some of) their open support for the secret ballot proposal and their (private) statements against the French text. In his final report, Robert Craigie suggested that he had lobbied for the French text for Common Article 3, but said nothing specific about his delegation's final vote. The same holds for the final report of the United States delegation. The Australian delegate William Roy Hodgson, by contrast, claimed that his delegation, and that of the United States, voted against the text “during all Committee stages.” It is unclear, however, whether he meant the plenary as well. Therefore, it remains under speculation whether any of the four major drafting parties, including the Soviet Union, were among the twelve rejection voters and the single abstention. However, considering their resistance vis-à-vis the secret-ballot-plan, the substantial number of (confirmed) rejection votes from (post-)colonial powers, as well as Morosov's congratulations for Lamarle's “success” following Common Article 3's acceptance, it is unsure although not unlikely that the Soviets had voted for Common Article 3. Report Dutch Delegation, no. 3045, Code-Archief Buitenlandse Zaken, NA; Report of Canadian Delegation to Geneva Conference, 1949, no. RG 19, Vol. 480-112-20, LAC; Report Joint Committee on Common Articles signed by Hodgson, Series: A1838; Control: 1481/1A Part 7, National Archives of Australia, Canberra; Final Report Craigie, November 1949, no. 4164, FO369, TNA; Cable Lamarle Civil War, July 29, 1949, no. 161, Unions Internationales 1944–1960, LAD. The best publication so far dealing with Common Article 3's drafting history does not provide any concrete thoughts as to which states had—or may have—voted against the final text for Common Article 3. Mantilla, “Forum Isolation: Social Opprobrium and the Origins of the International Law of Internal Conflict,” 340. 105. Ironically, after the Cold War, Common Article 3 was used to prosecute certain Communist crimes in times of non-international armed conflict. See Hoffmann, Tamás, “Individual Criminal Responsibility for Crimes Committed in Non-International Armed Conflicts: The Hungarian Jurisprudence on the 1956 Volley Cases,” in Criminal Law Between War and Peace: Justice and Cooperation in Criminal Matters in International Military Interventions, ed. Manacordan, Stefano and Nieto, Adan (Cuenca: Ediciones de la Universidad de Castilla-La Mancha 2009): 735–53. On the unintended consequences in the development of humanitarian law: Fazal, Tanisha M., Wars of Law. Unintended Consequences in the Regulation of Armed Conflict (Ithaca, NY: Cornell University Press, 2018). 106. Rapport Spécial Etabli par Pilloud, September 16, 1949, no. CR-254-1, AICRC. 107. Mantilla, “Forum Isolation: Social Opprobrium and the Origins of the International Law of Internal Conflict,” 319. 108. See Letter Hill to Speake on Stockholm Drafts, November 9, 1948, no. 2185, HO213, TNA. 110. Rapport Spécial Etabli par Pilloud, September 16, 1949, no. CR-254-1, AICRC. 111. Report of New Zealand Delegation to Diplomatic Conference of Geneva 1949, AAYS 8638 W2054 ADW2054/1220/3/3 (R18524114), ANZ. 112. Report of Canadian Delegation to Geneva Conference, no. 112-20, RG 19 – Vol. 480, LAC. 113. It is hardly surprising that the Soviets had reservations about those parts of the four treaties relating to international supervision, Protecting Powers, and the ICRC's assistance in case the respective government's consent had not been given. Also, they objected to Article 85 of the Convention Relative to the Treatment of Prisoners of War, because it touched directly on the issue of suspected war criminals and the rights of prisoners’ of war. 114. Final Record of the Diplomatic Conference of Geneva of 1949, 100, Vol. II, Section B, LOC. 115. Report of New Zealand Delegation to Diplomatic Conference of Geneva 1949, AAYS 8638 W2054 ADW2054/1220/3/3 (R18524114), ANZ. 116. Rapport Spécial Etabli par Pilloud, September 16, 1949, no. CR-254-1, AICRC. 117. This problem is specifically highlighted in a report from Swiss interpreters. Note sur l'activité du Service d′interprétation à la conférence diplomatique de Genève, 1949, no. E2001E#1967/113#16123:874, SFA. 120. This criminal court-related point resonates with a similar argument made for the Soviet position regarding the Genocide Convention. See Lewis, Mark, The Birth of the New Justice. The Internationalization of Crime and Punishment (Oxford: Oxford University Press, 2014). 122. Hirsch, “The Soviets at Nuremberg,” 702–3. 123. Fayet, “Le CICR et la Russie,” 69–70. 124. Junod, The Imperiled Red Cross, 278–79. 125. See Weiss-Wendt, The Soviet Union and the Gutting of the UN Genocide Convention. 126. Report Soviet-Ukrainian Delegation, no. F. 2, Op. 12cc, Spr. 969, Ark. 60-76, TSDAVO.